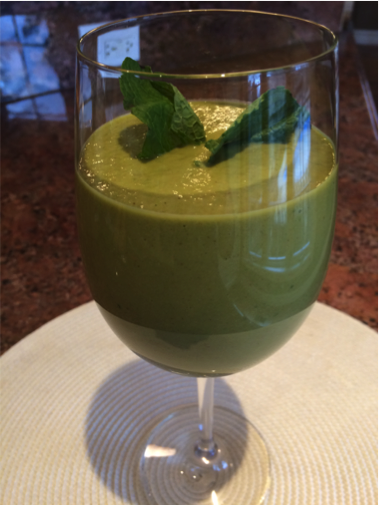 A smoothie, if made properly, can be a complete meal that is nutrient dense and very healthy. Ensuring that it contains healthy fats and proteins means that it will keep you satiated and keep your blood sugar levels more stable. If you are having digestive issues, it can be an excellent way to get your meals without irritating your digestive system. 1-2 handfuls (leafy greens) Leafy greens: spinach, kale, romaine lettuce, Swiss chard, collards, beet greens. Seeds and nuts also add protein to the smoothie. 1 tsp. to 1 tbsp. (depending on your taste) These add flavour and/or nutrient punch1. Choose one ingredient from each list and blend until smooth. Experiment with some ingredients of your own. The sky’s the limit. The important thing to remember is to limit the amount of fruit you use so it doesn’t affect your blood sugar balance. Maca powder is an adaptogen; it supports and regulates your adrenal glands. It is effective in increasing a person’s energy and libido! Raw cacao is a powerful antioxidant and a rich source of magnesium. Ginger is a powerful antimicrobial.